The communities of Wadi Barada have been under violent attack by Hezbollah and the Assad regime for over a month. Lebanese Hezbollah terrorists are trying to force out the local Syrian population. 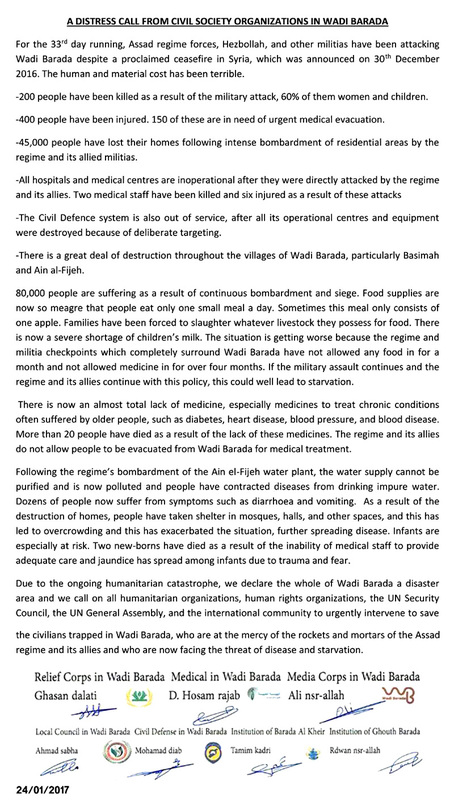 Wadi Barada’s civilians are in dire need of food and medicine. Wadi Barada could be reached by JPADS airdrops using GPS guided parachutes without aircraft having to enter Syrian airspace. The World Food Programme has used JPADS elsewhere in Syria but both the WFP and the UK refuse to help Wadi Barada. Theresa May dismissed MPs’ calls for airdrops as impractical but didn’t say the WFP was already using JPADS elsewhere in Syria. For the 33rd day running, Assad regime forces, Hezbollah, and other militias have been attacking Wadi Barada despite a proclaimed ceasefire in Syria, which was announced on 30th December 2016. The human and material cost has been terrible. 200 people have been killed as a result of the military attack, 60% of them women and children. 400 people have been injured. 150 of these are in need of urgent medical evacuation. 45,000 people have lost their homes following intense bombardment of residential areas by the regime and its allied militias. All hospitals and medical centres are inoperational after they were directly attacked by the regime and its allies. Two medical staff have been killed and six injured as a result of these attacks. The Civil Defence system is also out of service, after all its operational centres and equipment were destroyed because of deliberate targeting. There is a great deal of destruction throughout the villages of Wadi Barada, particularly Basimah and Ain al-Fijeh. 80,000 people are suffering as a result of continuous bombardment and siege. Food supplies are now so meagre that people eat only one small meal a day. Sometimes this meal only consists of one apple. Families have been forced to slaughter whatever livestock they possess for food. There is now a severe shortage of children’s milk. The situation is getting worse because the regime and militia checkpoints which completely surround Wadi Barada have not allowed any food in for a month and not allowed medicine in for over four months. If the military assault continues and the regime and its allies continue with this policy, this could well lead to starvation. There is now an almost total lack of medicine, especially medicines to treat chronic conditions often suffered by older people, such as diabetes, heart disease, blood pressure, and blood disease. More than 20 people have died as a result of the lack of these medicines. The regime and its allies do not allow people to be evacuated from Wadi Barada for medical treatment. Following the regime’s bombardment of the Ain el-Fijeh water plant, the water supply cannot be purified and is now polluted and people have contracted diseases from drinking impure water. Dozens of people now suffer from symptoms such as diarrhoea and vomiting. As a result of the destruction of homes, people have taken shelter in mosques, halls, and other spaces, and this has led to overcrowding and this has exacerbated the situation, further spreading disease. Infants are especially at risk. Two new-borns have died as a result of the inability of medical staff to provide adequate care and jaundice has spread among infants due to trauma and fear. 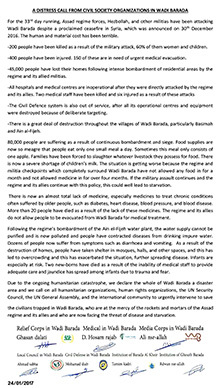 Due to the ongoing humanitarian catastrophe, we declare the whole of Wadi Barada a disaster area and we call on all humanitarian organizations, human rights organizations, the UN Security Council, the UN General Assembly, and the international community to urgently intervene to save the civilians trapped in Wadi Barada, who are at the mercy of the rockets and mortars of the Assad regime and its allies and who are now facing the threat of disease and starvation.